Sorry to tug at the heartstrings yesterday. I'll try to be more upbeat next week. Have a super weekend! Great photo! Lends itself so well to black and white. Just read your previous post. So touching..."and in the end, only kindness matters". How true those words are. 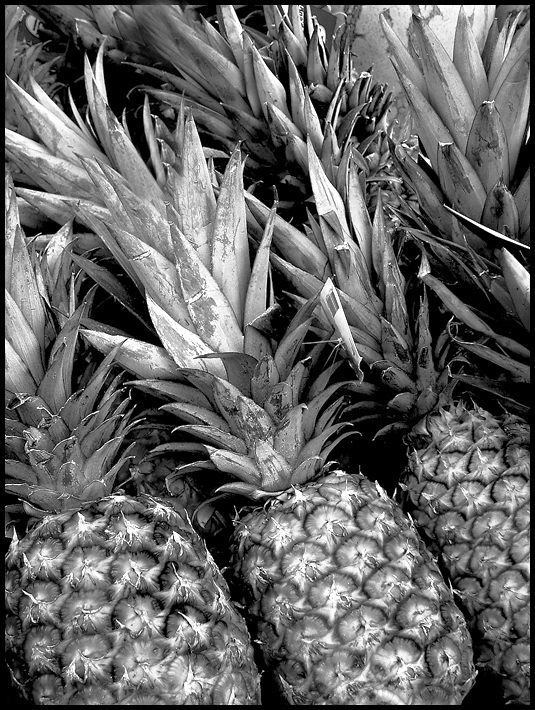 Great quote and super shot of the pineapples! I really enjoy sweet, fresh pineapple. Wonderful photo and the quote matches perfectly. I know it will not last but it is light drizzling at my home right now.... so not monsoon like. we recently had visitors from Florida who brought mangoes and pineapple. Just yesterday, we were eating some of the pineapple. Great pic! Have a great weekend. i just woke up and my brain did a funny movement around pineapple and being replaceable...idk. i should go nap more. have a good sunday! Love this and aim to be different!